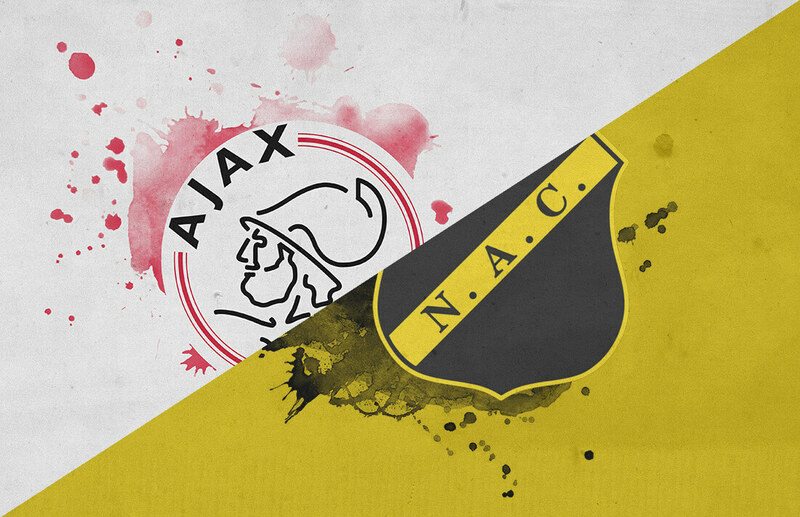 Ajax hosted NAC Breda in the Johan Cruyff Arena on their return to Eredivisie action. After their unfortunate Champions League loss to Real Madrid midweek Ten Hag’s men looked to recover with a win over the relegation candidates. Having received a boost on Saturday after Heerenveen held on to draw 2-2 with PSV, Ajax had the opportunity to regain some much-needed points on their rivals. The Amsterdam club showed no signs of a team in poor form. Dominating from the very beginning, Breda were disposed of in a five-goal thrashing. While 15 years ago Zlatan Ibrahimovic dismantled the Breda defence with a moment of individual brilliance, it was the collective excellence of the Ajax squad that prove to be the deciding factor in this meeting between the two sides. Interestingly Ajax remained unchanged to their match midweek. David Neres retained his place in the starting XI as Tadic was moved to a more traditional forward position. Kasper Dolberg and Klaas-Jan Huntelaar, therefore, were relegated to the bench. Relegation strugglers NAC Breda set up in a largely defensive back five. Defender Palmer-Brown returned to the starting XI after their defeat to AZ Alkmaar. Top scorer Te Vrede was still suffering from tendon problems so Gervane Kastaneer started up top. Throughout the match, Breda set up to concede the majority of possession and attempt to break on quick counters. 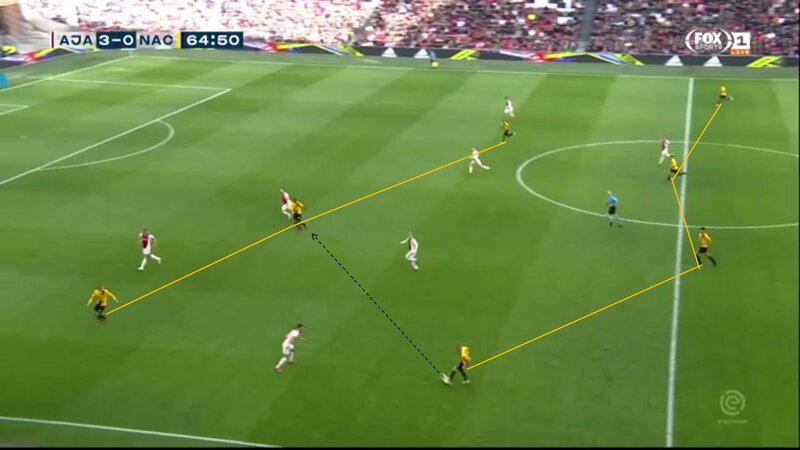 When Ajax had control of the ball, they organised themselves in a 5-4-1 mid-block. The general idea for their defensive structure in the first half at least seemed to be to have a numerical advantage and force Ajax into wide areas. They focused this by having the four midfielders stay narrow and tight, allowing Frenkie de Jong and Daley Blind to dictate play in these areas. 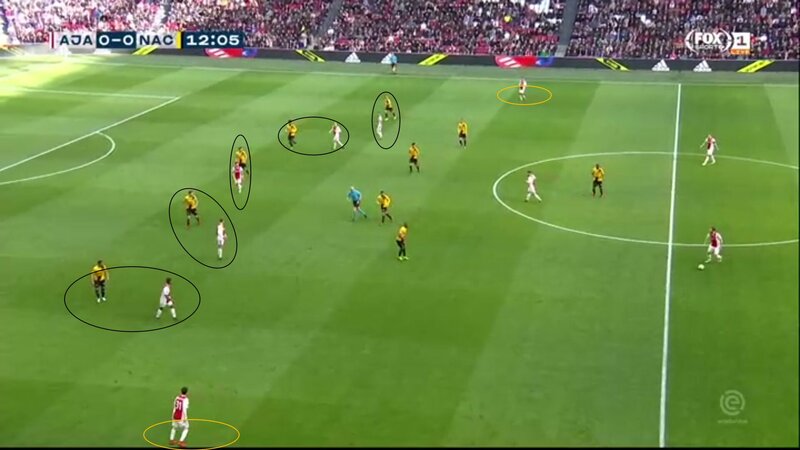 NAC Breda’s narrow defensive structure was intended to force Ajax into wide areas. The away team’s forwards placed very little pressure on the ball in the first phase. This can be a genuine tactic in a low lying, compact set up as you do not want players coming out of their structured position in these situations. Pressing the first phase of build up naturally means that players must stray from their intended positions. In order to gain an advantage from this, the team needs to sit deep and limit the amount of space offered to the opposition to a minimum. Breda did not do this. Instead of deploying a low block, Breda were positioned higher up the pitch. Therefore they allowed for space in behind their final line of defence. With no pressure on the Ajax buildup, De Jong, Blind and Schone were able to pick apart the Breda defence with ease. Despite their narrow structure, Ajax easily found gaps between the lines due to a lack of pressure on the ball and passive centre-backs. A familiar feature to Ajax’s possession play was on show within this game. Positional rotations are a huge tool in Ajax’s locker and they often utilise them to devastating effect. It was intriguing to see how the second-placed team reacted to being at such a natural numerical disadvantage in the final third. Ajax like to match their opponent’s defence in numbers so as to make a series of one-on-one matchups. Due to NAC Breda’s five at the back system, Ajax often positioned Frenkie high up in the left half-space. A slight difference to his regular positioning deep in the left half-space, this allowed Daley Blind to take more responsibility in the buildup. Ajax created scenarios in which their attackers matched the Breda defence one-on-one, leaving Tagliafico and Mazraoui free on either wing. It also allowed for some intriguing rotations on the left. With De Jong occupying the right-sided centre-back, Neres could drop to receive in the half-space. 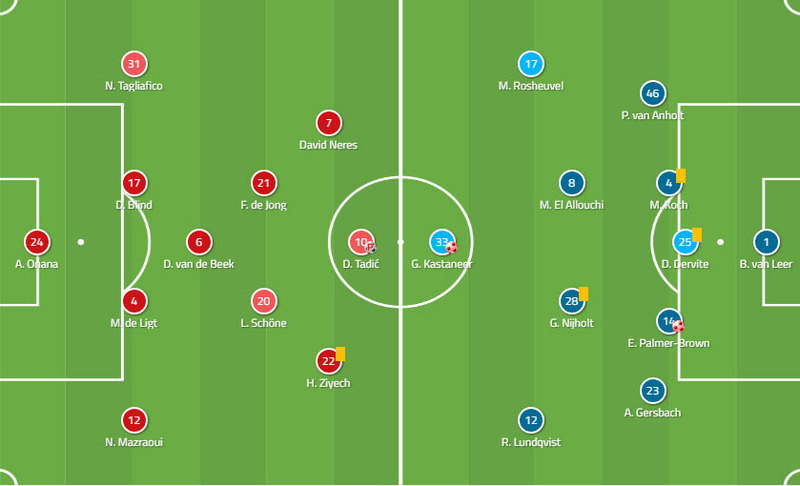 After forcing the right wing-back Van Anholt to press Tagliafico on the ball, De Jong dropped in order to create space. With Neres making the run in behind, Blind had the option of clipping the ball over for the Brazilian to run on to. Despite their limited time on the ball, the away team clearly had a set plan for when they gained control. Looking to Feyenoord’s six-goal demolition as an example of how to attack the title contenders, Breda set up to stretch the Ajax defence as much as possible. Setting up in a 3-4-3 system in possession, they used the full width of the pitch to try to exploit Ajax’s narrow defence. A typical pattern was for the team to build up on the left-hand side before playing a pass into the feet of Kastaneer. The Dutchman would then play a wall pass toward one of the two central midfielders so he could switch the play. This would ideally leave the Ajax full-back isolated against a Breda wide forward and wing-back. Although not often, Breda’s wide structure in possession did create some gaps in the Ajax defence. Unfortunately for Breda, although these moves brought some opportunities their play in the final third was lacking. Often they would be one pass away from creating a good shooting opportunity, only for the pass to be misplaced. In a must-win match for Ajax, the title challengers were clinical in their dispatching of the relegation fodder. Unfortunately for Breda, Ajax were too versatile in their attack for them to stand any chance. After PSV’s dropped points earlier in the gameweek, this was an important week for the Amsterdam club. After a rough restart from the winter break, Ajax seem to have found their form just in time.